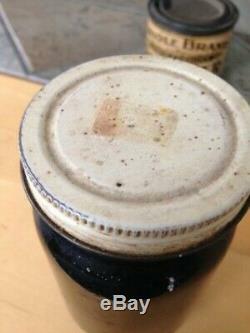 Vintage jar of Oriole Brand Pine Tar! 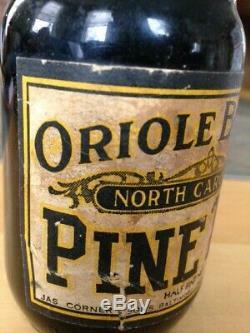 North Carolina on the label, small print on label says packed & distributed Baltimore, MD - Home of BABE RUTH, and Baltimore thus the Oriole connection. Opened and used at some point, but has plenty of pine tar still in it. Smells like the dugout and baseball season! The same brand pine tar used by the likes of Ruth, Gehrig, Foxx, DiMaggio, George Brett and all baseball legends through the years!!!! ALSO OPEN AND USED (Hunt also says circa 1930). Pretty sure the last person who bought ONE of these from me a few years back consigned it and made a nice profit, so if you want to do that again go for it. 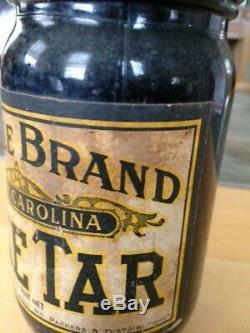 The same brand pine tar George Brett used in the famous Pine Tar Game. From which George Brett took the glop he smeared on his notorious pine tar bat in 1983 is in a case along with the pine tar ball Brett hit into the right field stands of Yankee Stadium, as well as the ticket stub of the fan who caught it and the signed business card of Orest V. Maresca, the magistrate who made the initial ruling in the ensuing controversy. 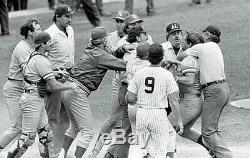 Halper had the pine tar bat, too, but Brett wanted it back. 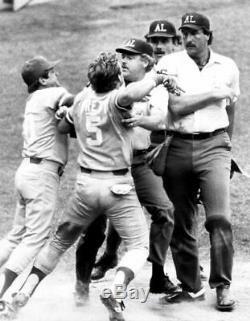 So the Sultan swapped it for Brett's pine tar uniform and the bat he wielded to hit three homers for the Kansas City Royals against the Yanks during Game 3 of the'78 American League playoffs. If you are a bat collector you need this to accent your bats! Or nice addition to any baseball collection as they have a great look and smell to them. SEE MY OTHER AUCTIONS FRO GREAT VINTAGE BASEBALL MEMORABILIA!! The item "RARE 1920's 1930's Vintage Baseball Bat Pine Tar ANTIQUE Game Used George Brett" is in sale since Wednesday, April 3, 2019. This item is in the category "Sports Mem, Cards & Fan Shop\Vintage Sports Memorabilia\Bats". 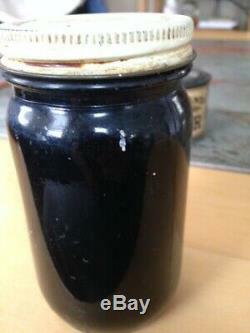 The seller is "jagr68lamo0" and is located in Wauconda, Illinois. This item can be shipped to United States, Canada, United Kingdom, Denmark, Romania, Slovakia, Bulgaria, Czech republic, Finland, Hungary, Latvia, Lithuania, Malta, Estonia, Australia, Greece, Portugal, Cyprus, Slovenia, Japan, China, Sweden, South Korea, Indonesia, Taiwan, South africa, Thailand, Belgium, France, Hong Kong, Ireland, Netherlands, Poland, Spain, Italy, Germany, Austria, Bahamas, Israel, Mexico, New Zealand, Philippines, Singapore, Switzerland, Norway, Saudi arabia, Ukraine, United arab emirates, Qatar, Kuwait, Bahrain, Croatia, Malaysia, Brazil, Chile, Colombia, Costa rica, Dominican republic, Panama, Trinidad and tobago, Guatemala, El salvador, Honduras, Jamaica, Viet nam, Uruguay.